There appears to be a distinct turning point in Indie game development, the point at which creating a game is no longer a project limited to pleasing you and transforms into a project you wish to share with others. Cole has taken some from some of the best, most iconic, games to fabricate a blend of delightful mechanics that are sure to please. Tell me a little about yourself, how did you come to developing games? I started back in 2011, pretty much as just a hobby while looking for work. But I've always had a passion for creating things. Game development is great because it can combine pretty much everything- audio, visuals, design, interacting systems, narrative etc. If you're into doing a bit of everything, solo game dev is a lot of fun. It's just a tag for games created by me. It doesn't really mean anything as I'm just a one-person developer and not a company or studio. More fun than just signing my name, though! Concrete Jungle isn't your first project, can you talk a bit about your previous endeavors? MegaCity was my first project, Concrete Jungle is a follow-up to it. It was a much smaller project, as all my games until now have been. In terms of sales, it wouldn't be considered 'a success' by most developer's standards, but it really showed me that game development could be a viable career option. Following that, I proceeded to make and release a couple of other projects: a top down co-op alien shooter called Planet Wars, a husky sled game called Sleigher, and a 2D WW1 aircraft game called Six O'Clock High. Each came with their own successes and failures, but I've learned a hell of a lot from making them. Through all this time, I've had ideas for a sequel to MegaCity cooking in the back of my mind. I've managed to try out a few prototypes in between projects too which were mostly ambitious failures. But, I've finally arrived at something that works and that I'm happy with. Broad-strokes, what is Concrete Jungle? It's a city planning, deck building game. You use cards in your deck to place buildings, then add to your deck as the city grows. 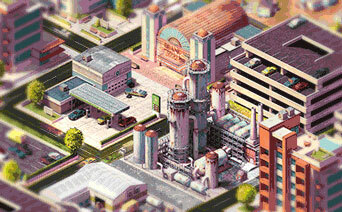 Although it's not a management game, it's a hybrid of different mechanics from throughout the gaming world. Care to explain the table-top card game mechanic? You start with twelve basic level cards, which are cycled through as you build. Various types of building will give you economy points which go towards adding new cards to your deck. When you have enough of them you choose between 4 random cards to add. Rinse and repeat. As you progress you'll find your basic cards less useful, and start working to remove them from your deck while picking up better ones. The game becomes a process of refining and honing your deck, while finding space to build your 'less desirable' buildings. What lessons did you learn from MegaCity? I learned it's sometimes best to keep things simple, which is hard for me sometimes as I love complex games. Simple doesn't mean shallow though, it's possible to have a simple game which has a lot of depth. That's what I hope Concrete Jungle is for people. You have a lengthy post on your site detailing the evolution of MegaCity to Concrete Jungle. Is there any way you can distill that a bit? Basically it involved trying out a whole bunch of different new ideas such as integrating more traditional City Building game play into the game and even trying out a tower defence-like mechanic with traffic in place of creeps. To cut a long story short, I couldn't get any of these ideas to work within the confines of the original game concept. MegaCity/Concrete Jungle rely on a very simple scoring mechanic. Once these complex game play elements were introduced it made it far too hard to keep track of scoring from the player's perspective. As a result, the prototypes weren't fun to play, so I went back to the drawing board. Which is a shame, but I gained a much greater understanding of what made the original game work in the first place. I'll never wonder if the game could of been better off with these changes. The one surviving idea was the deck building mechanic, which I think is a great addition and gives the game an extra dimension. Can cities ever come to a functional end similar to how SimCity cities achieve as much as possible with nowhere else to go? Currently no. In the single player mode I have it's really more of a 'survival' style of play. Space management is at the core of the game, but it's really about maintaining that throughout. You only get a limited amount of space at a time, and have to keep scoring points to get more. Once you start failing to do so, it's game over. Development-wise, how are the two games different? What programs are you using now? The deck building mechanic really gives the game a new dimension. I was always proud of MegaCity, but the randomness sometimes irked me (and a few other players). I still have a 'classic' game mode in Concrete Jungle which plays essentially the same as MegaCity, but with all the new buildings of Concrete Jungle. The deck building mode is a much deeper experience, though. 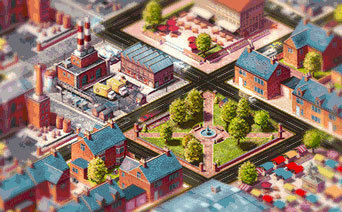 What I'm hoping will really set it apart is the still-in-development verses mode, which is a competitive city building mode where two players compete by building the same city. This mode is going to take the longest portion of my remaining development time. I have a basic version of it going. It's a lot of fun and a real change of pace from the other two single player modes. I'm using the same software, although a new version of it (Fusion 2.5), for the graphics I've gone from entirely digitally painted to a mixture of 3D rendering and digitally painted. Can you explain the 2-player mode in a little more depth? This is where two players attempt to outscore each other while building the same city. Each player takes it in turn to place down buildings, the goal being to outscore the other using the same mechanics found in the 'normal' mode. It's a really nice change of pace, and I'm going to include some AI to play against too. The game's story mode will be also centred around defeating other characters through this in order to unlock them for play. Each character gets a few unique buildings which bring with them their own strategies. SimCity was hugely important to me as I developed my love for video games. Concrete Jungle clearly pays homage to that. What else influences it? Me too! 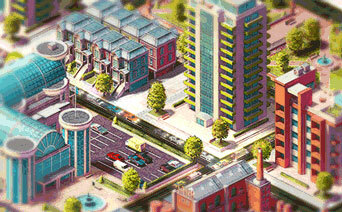 SimCity, as you stated, was an obvious influence for the theme and the isometric graphics. Tetris for the simple 'complete columns to gain more space' mechanic. The tabletop game Dominion for the deck building mechanics. Hearthstone's arena mode where you pick between three cards at a time was also something I loved, and I have my own version of that in Concrete Jungle. The TV show Parks & Recreation for the direction I'm taking in regards to the characters and story mode. I hope that makes an interesting concoction of influences! Are you also in charge of the art? Yes, the graphics are done by me also, as stated they are a mixture of 3D renderings and some Photoshop work. I wanted a very particular colour pallette that was vivid yet not too cartoony. Greys, browns, and blacks are replaced with deep blues, purples, oranges, and reds. The cars in the city whiz by at high speed. I wanted to make the game look like a time lapse video. What kind of scope can new players expect for Concrete Jungle? Clearly "sprawling metropolis" is off the table. I love big cities and the idea of making them in a game. 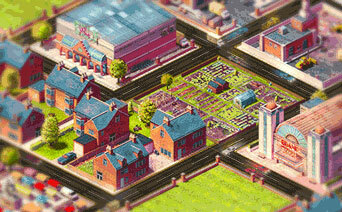 I was one of the people extremely disappointed in the limited city sizes in the most recent SimCity, for example. I tried a lot with prototypes to combine the sprawling metropolis' of older SimCity games with the game play of MegaCity/Concrete Jungle. I just couldn't get it to work on such a large scale with these mechanics. It became too complicated and boring to play. Limitations are often bad in sandbox games, but in a more challenge-orientated game like MegaCity/Concrete Jungle, they can sometimes be where the fun comes from. That's not to say you can't have big cities in Concrete Jungle, but, it's more like looking at a cross section of a big city. You can toggle on/off your previously constructed buildings and marvel at your handiwork! At the end of the day, the space limitation needs to be there to make the game work, in this case. In terms of replayability, is it possible to get every card in the game? Are players forced to make more calculated decisions instead of reaching for the biggest and the baddest? Yes, absolutely. This isn't a free-to-play game so all the cards will be attainable through play at a reasonable rate. There will be cards that are quite tough to get, but I don't want the game to be a grind either, so I plan to keep those unlockables within reach! When playing the game, there are frequently times where you might want to pick the card that's best for your situation rather than the card that's technically the best/most powerful. Even with the limited number of cards in-game already, that scenario happens a lot. Online interactivity is all the rage. Do you have any plans to incorporate social functions such as sharing cities via Twitter, scores, etc? Yes, online scores at the very least will feature. I'd like to expand on that with the functions you mentioned too, but it depends how smoothly the development goes. I plan to update the game for free after release with the stretch goals reached in the Kickstarter, so it's possible more social functionality will come with that instead of the initial release. Concrete Jungle has had a bit of an extended development period. What made you choose Kickstarter to get the job done? Why such a low goal? I'm a one-person developer, and I don't need a lot of money to function as one. My number one priority is making the game, so I'm happy to do so on as little as I can to make that happen, hence the low goal. I'd rather be working on Concrete Jungle with a low budget than not working on it having been too ambitious with funding goals. You have well exceeded your initial goal (and were funded as of yesterday! ), what are your thoughts on your stretch goals? Yes, although I didn't imagine the project would reach the goal so quickly, so it took me a little while to get them organized. I made a poll for my early backers to vote on- 'more buildings' received 50% of the votes and 'night time/other VFX' was the second favourite option at 25%. So these two things ended up being my main stretch goals. I also had a lot of people concerned about the expansion to the game causing delays, which was likely. So I opted to add these to the game for free after release to minimize that risk. The extra funding is also going towards localization of the game, more music for the soundtrack and some hired help for the building modeling. While still early, can you tease a little about what may be included in future content? The first thing I will be working on after release is a very sizable free update, funded by the extra Kickstarter money. More buildings and a 'night time' mode which will bring some more visual flair. After that I'll be looking to bring the game to some other platforms: iOS, Android and Linux will be the main three. If everything goes really well then maybe consoles. One step at a time though!